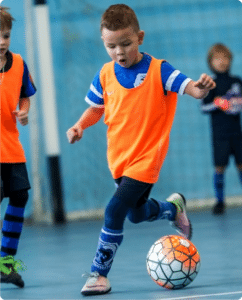 Welcome to our 2018-2019 Indoor Soccer Information page. This fun, instructor led program is run out of Lebovic Campus in Thornhilll. The program will be an introduction to our youngest players, and will be a great way to prepare for the outdoor season for our older players. Although this not a league, there will be a lot of game play and small sided games. Our goal with this program is fun, but is very much centered on individual skill development and touches of the ball. Our Technical team will have a great program prepared for all participants. The season will begin on October 17th and will run for 15 weeks. We have seen tremendous growth over the past few seasons with this program, and spaces for are extremely limited, so register now before it’s too late. Take advantage of our early bird registration, for only $200.00. Regular price will go up to $250.00 on September 14th.